One way in which historic bridges may be preserved is when a bridge slated for replacement is given to a new owner for relocation and restoration/rehabilitation. 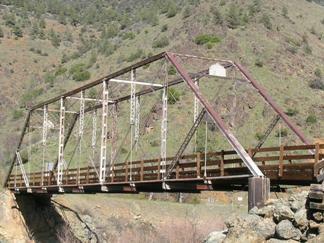 Similarly, abandoned bridges may be available for relocation and reuse. This is referred to a historic bridge marketing. Need a bridge for a bike path, nature trail, or golf course? Instead of spending money on a nondescript pre-fabricated truss bridge, consider instead reusing a historic bridge that will be a beautiful historic landmark, while also promoting the values of sustainability. Some states have made the bridges they are currently marketing available on a website. The links to those websites appear below. Washington State: Riveted steel 371 foot polygonal Warren through truss resting on ground with $1,000,000 available for further relocation assistance. Click to learn more. 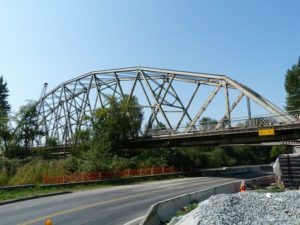 Additional Information: This bridge is a unique variation of the Warren truss with an appearance similar to a Turner type truss. The bridge has been set down on the ground in a location that anticipates the need for a new owner to utilize a crane to dismantle and ship the bridge to a new location. WSDOT has provided a package of inspection reports, photos, and other detailed information. Click here to download the package (195mb). Additionally, click here to view photos of this bridge on HistoricBridges.org. Contact Steve Fuchs at 360-357-2623 or via email at FUCHSS@wsdot.wa.gov with any questions or interest regarding this bridge. Washington State: Riveted-steel 90-foot Warren pony truss (Posted November 18, 2016). Click to learn more. California: Pin-connected 160 foot Baltimore through truss, fully disassembled and ready to be shipped. Additional Information: This bridge is a rare pin-connected Baltimore highway truss. Known as the Ash Creek Bridge, the bridge originally crossed the Klamath River on Klamath River Road in Siskiyou County, California. The bridge was carefully dismantled and put in storage by Stewart Engineering Inc, who is offering this bridge for sale at a negotiable price (buyer also pays for trucking). Please click here to view photos of the bridge including its condition in storage. Please contact Joe Savage, Stewart Engineering Inc. Phone: 530-244-8464 and Email: jsavage@sebinc.net with any questions or interest regarding this bridge. Note that states without an available link do not currently have a historic bridge marketing page. Please contact the DOT directly for inquiries on available bridges. A list of DOT websites is available here. United States Nationwide – Unconfirmed potentially available bridges on BridgeHunter.